How Fast Does Rose of Sharon Grow? Do Rose of Sharon Roots Cause Damage? What Is the Best Fertilizer for Rose of Sharon? How Fast Does a Rose of Sharon Grow? Rose of Sharon (Hibiscus syriacus) is a hardy hibiscus that is often grown into a hedge in many different climate zones. As far north as USDA climate zone 5 (Iowa and southern Illinois), gardeners value this plant for its pretty summer flowers and attractive foliage that you can prune to whatever shape you want. Determine a sunny location for your Rose of Sharon hibiscus plants and then measure the length of the planting area. This plant needs 4 feet between plants, so plan accordingly before visiting the nursery. For example, if you want a 20-foot hedge, purchase five plants. Measure 4 feet between planting holes and then mark their locations with anything handy, like a trowel or bucket. Dig holes in the places you marked. Make sure the holes are larger than your plants’ rootballs and add in one large shovelful of organic compost, one cup of Perlite or vermiculite and one shovelful of peat moss into each hole. Thoroughly mix these ingredients into the soil. Plant your Rose of Sharon plants into the holes you prepared and then backfill with the soil you dug out. Pat the soil down firmly around each plant and water them well. Trim your Rose of Sharon plants into the hedge configuration you want when they begin to send out rapid new growth at the beginning of spring. Trees planted in partial shade may grow at a slower rate and the amount of pruning may also affect the size of the tree. Pruning is encouraged to produce a fuller tree with more branches and bloom and to discourage branch breakage. Rose of Sharon may grow at a slower rate if planted in compacted or clay soil, as the root system may have a more difficult task of developing. Wet soils with poor drainage may encourage disease, also creating a smaller or thinner tree. Rose of Sharon can be added to a landscape as a single ornamental tree or can be planted as a hedge for the look of a line of shrubs. This tree provides a lush amount of foliage and can be very attractive along your property line. Rose of Sharon can be very invasive, as hundreds of seeds are created and dropped to the soil after each blooming season. It is advisable to pull young seedlings as soon as they sprout before they have an opportunity to create strong roots if you do not want many new trees to grow. Prune the rose of Sharon in the early spring before the growing season begins. When rose of Sharon is not pruned, the shrub produces many small blooms. Pruning results in larger blooms, but fewer in number. Water rose of Sharon bushes generously during the growing season. Although established plants withstand drought conditions, watering helps keep the rose of Sharon blooming throughout the summer. Mulch rose of Sharon shrubs before heavy frosts hit the growing area. Remove any dead or diseased stems and branches while mulching. Also remove any starts growing at the base of the shrub to keep the bush from becoming invasive. These starts may be transplanted to other areas of the landscape. Propagate rose of Sharon bushes by stem cuttings taken in early spring before new growth forms. The rose of Sharon also grows from seed, but stem cuttings speed up propagation. Treat any leaf disease or insect infestations immediately with a quality fungal powder or insect repellent. According to Ohio State University, older rose of Sharon shrubs become susceptible to trunk cankers. Left untreated, the canker may cause the shrub to die. Look at the size of the planting. Some consider Rose-of-Sharon a shrub, and others may consider it a tree. Rose-of-Sharon grows from 8 to 10 feet tall and spreads from 4 to 10 feet wide. Check its bark. Rose-of-Sharon bark is thin with thin branches throughout. Its color is gray. Examine its flowers. Rose-of-Sharon flowers are showy, 4 inches wide and can be either single or double. They are a shade of red, white, purple or pink. Also, a big identification indicator is that Rose-of-Sharon blooms throughout summer, unlike similar plantings. Look at the foliage. Rose-of-Sharon leaves are medium green, 3 inches long and have three distinct, shallow lobes that are shaped like an egg. Stand back and look at the overall shape of the plant. Rose-of-Sharon is vase shaped. The roots of Rose of Sharon, a flowering tree or shrub that can reach 10 feet in height, generally won't cause damage because they grow just below the surface of the soil. But as with any tree or shrub that size, it's a good idea to not plant a Rose of Sharon directly over, or adjacent to, drain pipes or septic tanks. 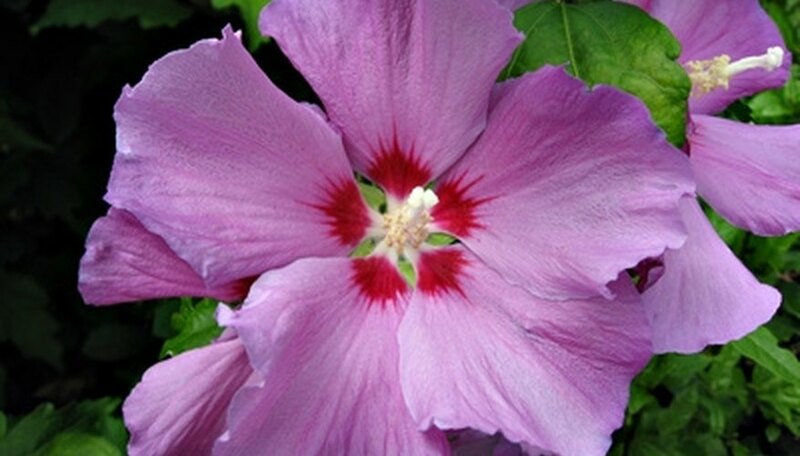 The National Gardening Association recommends planting Rose of Sharon (Hibiscus syriacus) in the spring or fall. You can also take cuttings from the shrub. Plant new cuttings in late spring and more mature ones in the summer, according to Fine Gardening's website. Prune Rose of Sharon in late winter or early spring. Flowers form on new growth, usually in May or June. Early pruning, therefore, stimulates shorter new growth without diminishing blooming. Cut thin branches back to the heavy branches from which they grow. New shoots will form, shorter than what you have pruned, and multiple new shoots will make shrubs bushier. Trim heavier main branches back only if growth is seriously out of control. Main branches can be cut back to 2-3 feet in height. Early spring remains the best time to conduct this major reshaping of your shrub. New growth can be thinned after blooming for appearance, but major pruning should be done while the shrub is still dormant. Dead branches can be removed at any time. Note any dead, diseased or damaged growth on your Rose of Sharon. Dead growth will not move with the wind and will feel brittle. Damaged or diseased growth bears physical discoloration, wounds or marking. Cut off this unhealthy wood at its base using pruning tools. Choose anvil pruners for growth 3/4-inch thick or less and lopping shears for thicker growth. In between each cut, spray your tools with disinfectant spray to prevent any bacteria from infecting healthy wood. Rejuvenate the Rose of Sharon by pruning away up to one-third of the oldest branches. Remove the branches at their base. Choose old and tall growth, which you can identify by its thicker stems. Thin heavy areas of the bush by trimming branches back to a Y intersection. Thinning prevents Rose of Sharon bushes from becoming too bushy and improves air circulation, which keeps the bush healthy. Rose of Sharon’s large flowers bloom from July through September in a range of colors, including white, purple, red and bicolor. The green leaves provide little autumn color. Thin, grey bark covers the multiple trunks. Though often propagated through cuttings, it also grows well from seed. Established plants self-sow easily. Mature Althea reaches heights up to 12 feet with widths reaching 10 feet. The upright growth creates a vase-shape unless pruned into a tree form. Rose of Sharon requires full sun to partial shade. While it performs best in fertile, moist and well-drained soil, the plant’s adaptability allows it to grow in almost any soil. It survives in USDA zones 5 through 8. Prune or trim in the early spring to shape the shrub. Amend the soil with compost and spread a 3-inch layer of mulch before the summer heat. Water the plant during extended dry spells. The Rose of Sharon (Hibiscus syriacus) does not require special fertilizer because it grows in all soil conditions. Too much fertilizer can cause bud drop or produce growth that attracts aphids. Fill a shallow pan 1 to 2 inches full of seed starter mix or well-draining potting soil. Gently push each seed ¼ inch below the surface of the soil and cover with dirt. Leave ½ inch of space between each seed for optimal growth. Use a spray bottle to fully mist the soil with purified water. Regularly mist seeds to prevent drying out during germination. Place pan in a location with temperatures between 68-70 degrees Fahrenheit and indirect sunlight. Seedlings should emerge within 10 to 20 days. The Rose of Sharon grows about 13 to 24 inches per year, depending on soil, drainage, water, light and exposure, according to the Arbor Day Foundation. What Is a Curly Willow Tree?